Animal welfare campaigners staged demonstration outside the Nepali Embassy in London on Friday as part of their campaign against Nepal government's involvement in the breeding of rhesus monkeys for biomedical research in America. 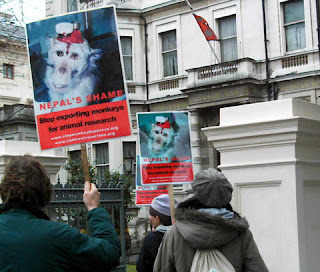 Protesters gathered outside the embassy at 10:30 am GMT, with posters showing a suffering lab monkey and the heading “Nepal's Shame”, a statement issued by the Stop Monkey Business Campaign said. Campaigners display pamphlet during the protest in front of the Nepali Embassy in London, demanding ban on export of rhesus monkey from Nepal on Friday Feb 22. The protest was the first in the UK in support of the global Stop Monkey Business Campaign. Two representatives of the campaigners talked with Jhabindra Aryal, Counselor/Deputy Chief of Mission of the Embassy, and conveyed their concerns regarding the trade of monkeys for export to American 'research' companies. Aryal on his part promised to pass on the campaigners’ concerns to the Nepal government, the statement added. The campaigners have urged the Nepal government to stop the export of monkeys for experimentation, which causes great suffering. They say that exposes of animal ‘research’ companies, including the ones on Washington and San Antonio which have established offices in Nepal, have shown time and time again of the untold suffering and fraudulent research that goes on in the name of science. The London demonstration was part of a growing global campaign pressurizing the Nepal government to ban the export of rhesus monkeys for commercial or scientific use. Earlier this month, campaigners protested at the Nepali Consulate in Amsterdam, Holland. Similar demonstrations will be held in France and other European countries in March.